Playing the long game in the search for female developers. Hall asked a simple question: Why didn’t Chipps, a brilliant engineer, ever apply to work at Fog Creek? Chipps said she didn’t think she would make it through their rigorous testing process. The gender imbalance at Fog Creek is not by design. “Fog Creek was never that typical brogrammer atmosphere,” says Hall, who started at the company when it was just her and four other men. Hall estimates she gets one female applicant for every 100 male candidates. But she never quite got why: “It was always a safe space, it was always supportive,” she says. In addition to all the usual tech company perks, work-life balance is a priority at the company. Five of the six executives across Fog Creek and Trello have at least two young children each. Hall leaves work at 4:30 p.m. every day to pick up her kids. “I didn’t know why we weren’t getting the candidates and I didn’t know how to solve the problem,” added a frustrated Hall. That is, until she talked to Chipps. That conversation led Fog Creek (and Trello) to its current counterintuitive solution to getting more female developers at the company: helping other startups and tech companies hire technical women. Hall realized the paths of women applying to work at Fog Creek looked a lot different than those of male candidates. The aspiring female programmers tended not to come from traditional computer science backgrounds. Many had switched careers, went to a bootcamp or Hacker School to acquire new skills, and sought junior- or entry-level positions. But Fog Creek, a relatively small enterprise, doesn’t have leveling. “We need you to join the team and have full autonomy and run,” explained Hall. Unlike a place like Etsy, which has used junior positions to train women straight out of Hacker School, Fog Creek has little room for fostering greener talent. As for more qualified women, the homogenous makeup of the tech team at Fog Creek deters them from applying. And so, the lack of women is a self-perpetuating “chicken-and-egg” problem. Much like the diversity problems throughout the tech industry, multiple factors have led to and sustained the imbalanced makeup of Fog Creek’s team. Yes, it’s partly a pipeline problem: there are fewer classically trained and qualified women. But, it’s also a mentorship issue. Some women have turned down offers from Fog Creek to work at places where they had mentors or could potentially find mentors in other female employees. Given the complexities of the problem and the company’s limited resources, Hall realized she couldn’t just hire more women. So she decided to play the long game by helping women get technical jobs–anywhere. The result is a joint fellowship in partnership with the New York-based code academy Flatiron School. After graduating from Flatiron’s rigorous three-month program, selected fellows have access to a mentor and office space provided by Fog Creek and Trello for eight more weeks. The fellowship doesn’t pay and the fellows don’t work for Fog Creek or Trello. Instead, the program focuses on helping the fellows get jobs elsewhere, or work on projects that might make them more desirable candidates elsewhere. Throughout the program, the mentors coach the women in technical interviews, give them feedback on possible application mistakes, and give them tips on code review. 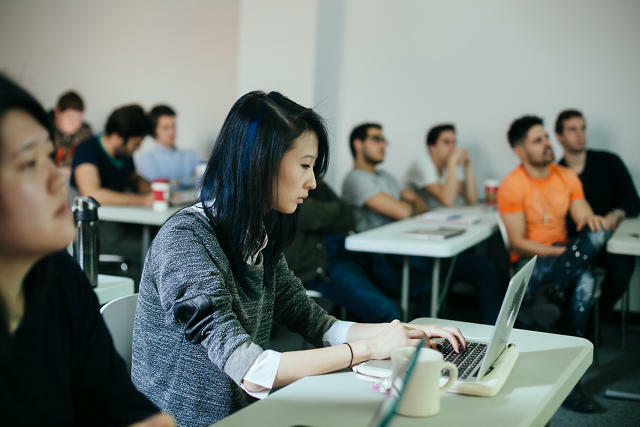 Of the 16 women in the first class who graduated in the fall, 14 found work as software developers within 120 days of leaving Flatiron School. The other two were not job seeking at the time. The fellows ended up at some of the best companies for coders in the New York City area, including Refinery29, Kickstarter, Medidata, BuzzFeed, Intel, TurboVote, BarkBox, and The Wall Street Journal. Fog Creek doesn’t get any immediate benefits, although Hall says the mentors learn a lot from working with people who have different experiences, backgrounds, and chromosomes. The justification for the program is as follows: Down the line, these women will have more experience and might apply for general developer level jobs at Fog Creek. “The payoff isn’t immediate in terms of a pipeline to hire,” admitted Hall. But: “Two, three, five years out, we have this huge community of female developers who are two, three, five years into their successful careers (hopefully) that have personal relationships with our internal developers.” Even if those women don’t want to come back to Fog Creek, they might recommend it to a female friend or colleague.